Every time I order sushi, I swear I’m getting something different and then I order a salmon skin roll. Perhaps that’s because salmon skin rarely shows up anywhere else in my life and I have to get my fix. Props to the Japanese for inspiring this cross cultural dish. Prepare your toppings and place them in small bowls. Preheat oven to 400°. Place salmon skin on baking trays lined with silpat, greased baking paper or parchment. Roast the salmon skin until it is crisp, draining off the excess fat every few minutes if you need to. This can also be done under the broiler, but don’t use silpat or any kind of paper because it will burn. Watch the skins very carefully so they don’t burn. Cool. Slice or break the salmon skins into pieces. Set them aside. Sauté onion with ginger and garlic until they are translucent, stirring constantly. Add red pepper, mushrooms and water chestnuts and continue cooking until the mushrooms are soft. Add soy sauce and salt and pepper to taste. Add the bean sprouts and cook for one more minute. Remove from heat. Put the mushroom mixture in a bowl on a platter with the salmon skin and lettuce leaves to serve. 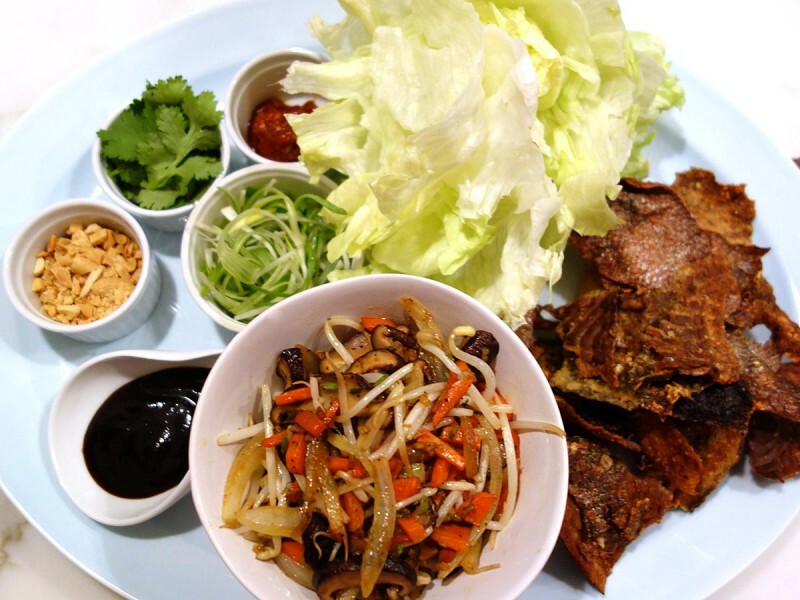 To eat, each guest puts the mushroom mixture in the lettuce leaf and tops with salmon skin and their choice of toppings and eats it like a taco. You can ask your fishmonger to save the salmon skins for you or buy them at a Japanese fish market like Mitsuwa in New Jersey.